USS Nevada (BB-36) heading down channel, afire from several Japanese bomb hits, as seen from Ford Island around 1000 Hours. Ship whose boom and flagstaff are visible at left is USS Avocet (AVP-4). The dredge line visible across the center of this view almost extended across the channel. To pass it, Nevada had to sail close to the Navy Yard, and bombs intended for her hit USS Shaw (DD-373) in Drydock YFD-2. 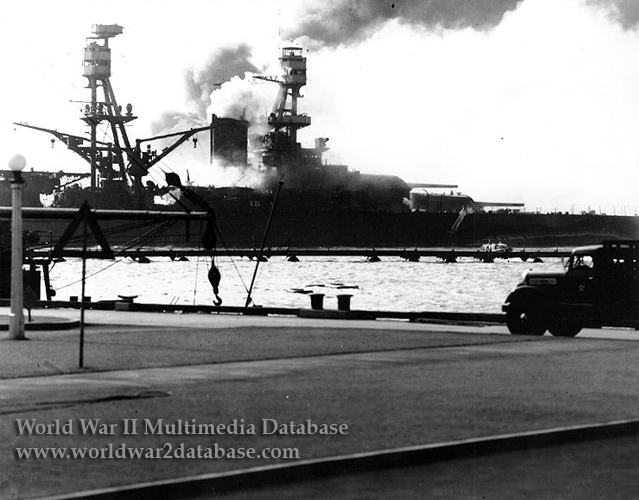 Nevada's After Action Report dated December 15, 1941, stated "From the above it is apparent that the Nevada suffered at least six (6) bomb hits and one torpedo hit. It is possible that as many as ten bomb hits may have been received by the Nevada, as certain damaged areas are of sufficient size to indicate that they were struck by more than one bomb. However, direct evidence is not available to determine the exact number. The holes created. by bomb hits indicate that all, with one possible exception, were 12" in diameter (very Nearly). It is possible that all were of that size. Some may have not exploded or may have contained less explosive than others. The damage, while considerable, should be capable of speedy repairs once the ship is afloat and alongside a dock in the Navy Yard." Note camouflage Measure 5 false bow wave painted on Nevada. Nevada was painted in Measure 1 overall, listed by the Bureau of Ships in January 1941 as "a Dark Gray System - The all around most effective system to be used in normally CLEAR weather for low visibility to both surface and aerial observers during day and during night under both direct searchlight and natural illumination, combined with a certain amount of course deception to surface observers." Measure 5 was intended to confuse possible submarine and surface opponents as to Nevada's actual speed.